Everyone knows who is playing in this year’s BCS National Championship Game. Most could tell you that Oregon and Wisconsin are playing in the Rose Bowl. Some would be able to rattle off a couple other participants in BCS bowls, be it Stanford or Oklahoma State. But, only the true follower of college football could name the players in the 2012 Orange Bowl and it would take an avid fan to tell you anything about the seasons of the Clemson Tigers and the West Virginia Mountaineers besides that they have each won their respective conferences and a resultant trip to the Orange Bowl in Miami, Florida. It is likely that the small amount of national attention paid to the 2012 Orange Bowl has contributed to the comparatively low price for tickets compared to other bowl games. As members of the ACC and the Big East, Clemson and West Virginia went largely unnoticed throughout most of the season. The Mountaineers virtually wrapped up their conference title and automatic BCS berth in mid-November. And, with Clemson’s win over Virginia Tech in the ACC Championship, the Tigers secured a BCS berth (Virginia Tech still received an at-large spot to face Michigan in the Sugar Bowl). The face-off of two conference champions should drive up the price of tickets, but this has not been the case over the month leading up to the game. As of December 29th, tickets sold through SeatGeek for the 2012 Orange Bowl are averaging $116.57, which ranks the game’s prices as the lowest of the 5 BCS bowl games, and over $50 less than the next cheapest BCS game, the Sugar Bowl ($170.95). Seats for the Orange Bowl are also selling for less than the Cotton Bowl, the Outback Bowl and the Capital One Bowl. 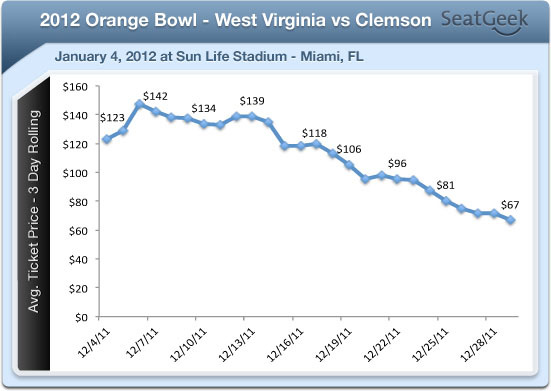 Beyond the relatively low average price of Orange Bowl tickets, the price has been falling fairly consistently since the matchup was announced. The three-day average from December 4th (the day the match-up was set) to December 6th was $147.30. Since then, seats have fallen to less than half of what they were. The average ticket price from 12/27-12/29 was $66.87. Can West Virginia and Clemson Compete with the Secondary Market? Face value tickets for the Orange Bowl are being sold starting at $99 through West Virginia and $110 through Clemson. However, listings on SeatGeek are currently as low as $15. Although that price will get you a seat in the upper deck, there are seats on the field level for as cheap as $55. As the game gets closer, it is likely ticket prices will fall even more. Several universities have policies prohibiting the resale of student tickets during the regular season. However, bowl games are played at neutral sites and there is less oversight from university ticket offices. Each bowl game allocates several thousands of tickets to both participating schools, which make up the lion’s share of the stadium’s capacity. Depending on the bowl, the school and sometimes the participating conference are often responsible for selling the team allotment. But, as the secondary market prices fall, students choose to bypass their school’s ticket office and buy on the secondary market. This issue has plagued other bowl games this year, forcing some universities, like the University of Houston, to subsidize student ticket prices to compete with the secondary market. Other schools, like Virginia Tech, have tried to market to students directly, pleading with them to buy tickets from the university athletic office and not on the secondary market. As for the Orange Bowl, Clemson’s website claims they have sold their allotment of $110 tickets, but they still have more expensive seats remaining. West Virginia is still offering tickets in all sections, starting at $99. With the game still five days away, it is likely prices will continue to fall in the secondary market and it will be interesting to see if Clemson and West Virginia respond. Either way, it is unlikely that this method of ticketing will be changed any time soon. Listings for the 2012 Orange Bowl can be found via the link below.